Global analysis: effect of measles vaccination coverage on measles mortality. There has been a global decline in the number of measles deaths over the last decades. This decline is caused by vaccination programs, without which death rates would probably be increasing. That is what we are told by the World Health Organization (WHO). But is this true? How did the WHO come to these conclusions? Are they based on what we observe or not? You may have seen a graph showing the relation between vaccinations and measles deaths for England or the USA. But what about the other countries in the world? Do they show the same correlations? Nobody ever bothered to look at the available data untill now. I looked at changes in vaccination rate coverage & measles deaths for all countries in the world from 2000 to 2015. Of these, 90 countries had data available over this period. 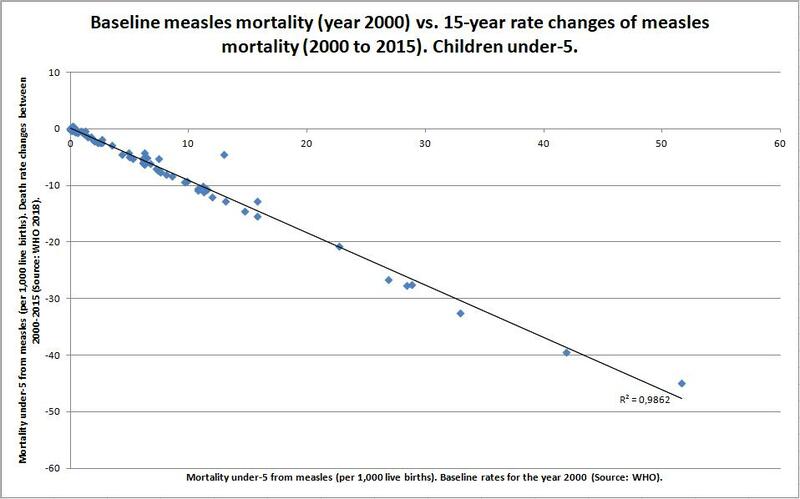 Then I correlated this data to see to what extend vaccines contributed to the decline in measles mortality. Controlling for possible confounding factors. There was a weak but significant beneficial association between vaccinations and measles mortality. Which disappeared after adjustment for confounding factors. According to the World Health Organization (WHO), measles is one of the leading causes of death among young children. With 89,789 measles deaths globally in 2016. The WHO states that vaccines resulted in a 84% drop in measles deaths between 2000 and 2016. And that “measles vaccination prevented an estimated 20.4 million deaths making measles vaccine one of the best buys in public health”. Attributing factors to higher measles-related deaths are malnutrition/vitamin A deficiency, inadequate health care and weakened immune systems due to HIV/AIDS or other diseases . As a source for the claim that 20.4 million measles deaths were prevented by vaccines, the WHO on one of their webpages , refer to a scientific publication . The following figure shows us the study results from this publication. The dotted line next to the red arrow indicates the estimated number of measles deaths in absence of vaccination. The uninterrupted line next to the green arrow indicates the estimated number of measles deaths with vaccination. Or: the estimated current situation. The researchers concluded that the difference in space between these two lines (the blue-grey area), showed the number of deaths prevented by vaccination. WHO estimates for measles deaths prevented by vaccinations. According to the researchers, the model above is based on an existing model used before in an article publised in 2012 in the Lancet (famous scientific journal) . In both articles, the researchers don’t explain how they created the trendline for “estimated no. measles deaths in absence of vaccination” [3, 4]. It would appear, these are based on assumptions. They didn’t do any calculations based on factual data. Still, the researchers came to the following conclusion: “Compared with no measles vaccination, measles vaccination prevented an estimated 20.4 million deaths during 2000-2016”. What are notable factors in the figure? We will assume the uninterrupted line is correct. On a global level, the number of deaths from measles has decreased. The WHO captures mortality data yearly since 2000. 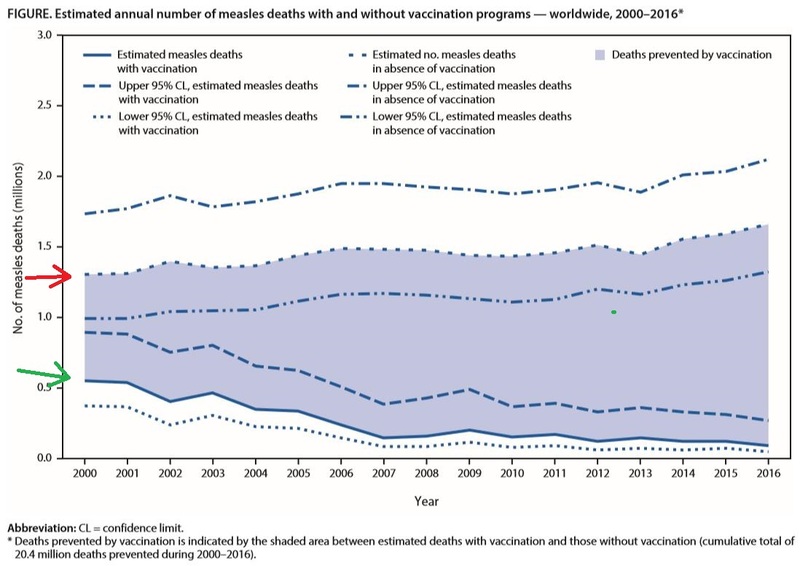 1) The trendline for “estimated measles deaths with vaccination” declines. The trendline for “estimated no. measles deaths in absence of vaccination inclines. 2) These two trendlines don’t start off at the same point in the figure. The line for “estimated no. measles deaths in absence of vaccinations” starts off at a much higher point. Is there reason to assume the amount of measles deaths would increase in absence of vaccinations? No motivation is provided. There is not that much historical data about the measles. Much of what we can find, relates to the USA and England/Wales. a) In the USA numbers are given from 1900/1912. In the first decade with data, there were 6,000 measles deaths annually. Vaccinations are given since 1963. In the decade before vaccinations, there were 400-500 measles deaths annually . A descent decline without vaccinations. Take into account there would also be a large population growth from 1912-1963. Which increases the relative decline in mortality. b) In England/Wales numbers are given from 1873. In the category “children aged 1-5” the yearly death rate from measles reached 307 per 1,000 live births . Over 30% of all kids! Vaccinations are given from 1968. In 1967, a total of 99 people died from measles in the entire country . A huge decline. So there was a “natural” decline in meales mortality in the USA and England/Wales before vaccines were introduced. It is unclear why the researchers [3, 4] assumed global death rates for measles would increase. Why does one trendline start off much higher than the other one? No motivation is given. We can see the distance between the lines behind the red and green arrow is about 0.75 on the vertical axis. This value stands for 750,000 measles deaths per year. Including the year 2000, there are 17 years in the figure. 17x 750,000 = 12.75 million. 20.4 – 12.75 = 7.65 million. This amount of deaths would have been prevented from changes occurring between 2000 and 2016. So the other 12.75 million measles deaths would be prevented from existing circumstances related to vaccinations. An assumed initial advance, so to say. -Measles vaccination coverage from 1980-2016. -Measles mortality (children under-5) from 2000-2015. Based on this data, it is possible to calculate changes in measles vaccination from 2000 to 2015. And link this data to calculated changes in measles mortality from 2000 to 2015. For some reason, nobody actually used the available data to calculate the effect. So I decided to step in. Global analysis: How do changes in vaccination rate correlate to changes in measles mortality when we look at all the countries in the world with available data? Data about measles mortality can be found on the WHO website. They are available as rates for child mortality under-5 (per 1000 live births) . Data about measles vaccination and possible confounders for the association with measles mortality can be found on the World Bank website. They are available as % of children immunized against measles at ages 12-23 months . 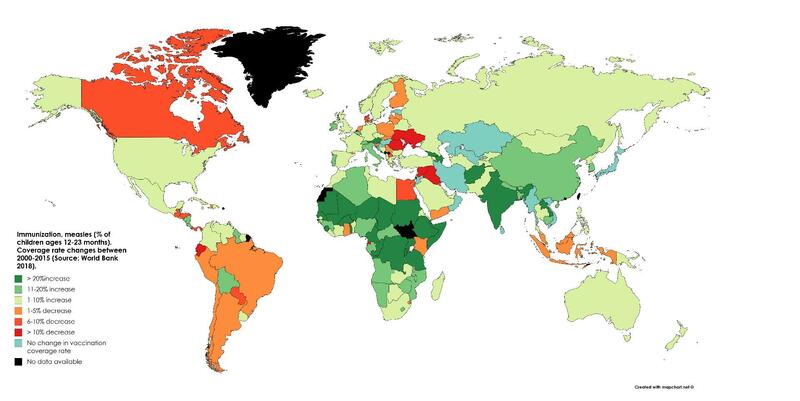 World map: 15-year changes in vaccination rate coverage. World map: 15-year changes in measles mortality. Children under-5. How well changes in vaccination rate and measles deaths are related, was examined by linking them to each other For this analysis, countries with zero measles deaths in either 2000 or 2015 were included. But countries with zero measles deaths in both 2000 and 2015 were excluded. It is impossible to test if vaccines change the amount of measles deaths when no deaths occurr. The figure below countains data for 90 countries. Figure 1. 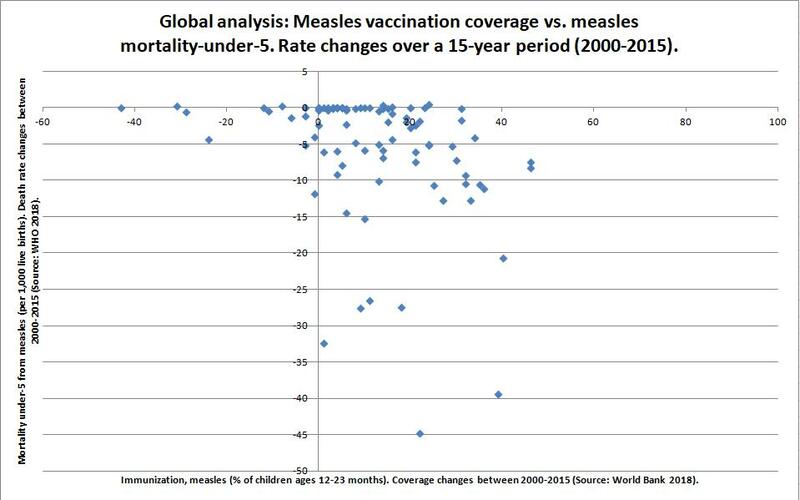 Correlation between measles vaccination and measles mortality. Including data from 90 countries. What do you see when you look at figure 1? Take a good look and ask yourself if this data clearly shows that stronger increases in vaccination rates are related to lower mortality from measles. Do you see that measles mortality decreased in most countries, regardless of the change in vaccination coverage? Figure 2 is the same as figure 1. But I added a trendline. The trendline goes down. and the effect was statistically significant (P = 0.002). There you go, vaccinations clearly decrease measles mortality rates, you could say. Figure 2. Correlation between measles vaccination and measles mortality. Trendline included. Vaccinations can explain only 10% of the variation in effect. Before we get to make any conclusions, look at the value added to the trendline. It says: R2 = 0.1038. The R2 (R-squared) value indicates the % of variation in measles mortality that is explained by the vaccinations. An R-squared value can be between 0 and 1, explaining between 0 and 100% of the variation. For vaccinations, the R-squared value = 0.10. Meaning vaccinations “account” for 10% of the change in mortality in this model. Confounders for the relation between vaccinations and measles mortality. Confounders are indicators that can disrupt associations we see. Like the correlation between vaccinations and measles mortality. Measles mortality rates can also be influenced by other factors. Using statistical software, it is possible to look at the combined effect of 2 or more indicators at the same time. For instance, we can link undernourishment and measles vaccinations to measles mortality at the same time. This way, we can see if the effect from vaccinations (or undernourishment) changes. Table 1. Possible confounders for the relation between measles vaccinations and measles mortality. Then I looked how these possible confounders were related to measles mortality. Because I examined the relation between 15-year changes in rates of vaccination coverage & measles mortality, I also looked at 15-year changes in rates for the confounders over the same period (2000 to 2015). The results can be seen in table 2. The R-squared value shows how well the confounder explains the variation in measles mortality. The unstandardized coëfficiënt shows the effect size. Not all countries had data available to examine the correlation with mortality. Table 2. Examining the relation between possible confounders and measles mortality under-5. P for significance = < 0.05. Red colours indicate a positive association (unbeneficial effect with higher exposure). Green colours indicate a negative association (beneficial effect with higher exposure). We can see that higher exposures to income (GDP), air pollution, maternal mortality, neonatal mortality and access to clean fuels for cooking were related to higher rates of measles mortality. These results may seem counterintuïtive for GDP and access to clean fuels for cooking. Higher exposure to clean drinking water was associated with lower rates of measles mortality. Nutritional- and sanitation factors were unrelated in this model. The WHO links HIV prevalence and vitamin A deficiencies to higher measles mortality rates. Because the scientific literature is not clear on HIV and vitamin A supplements, I did not include them as possible confounders. I did test their correlation to measles mortality in my model. No significant correlations were found for vitamin A supplement use (R2 = .02; P = 0.36), no. children aged 0-14 with HIV (R2 = .00; P = 0.83), or death rate for HIV/AIDS under-5 per 1,000 live births (R2 = .00; P = 0.98). Which indicator(s) are the best predictors for measles mortality? Vaccinations or possible confounders? This can be examined through a process called “forward stepwise regression”. Which is a process where you take the indicator which has the strongest correlation with the outcome (measles mortality). Then you add each of the remaining indicators one by one to see which one of them increases the explanation for variation of effect (R-squared value) the most. You stop at the moment where the R-squared value can no longer be increased by adding another confounder to the model. I included measles vaccinations and those indicators in table 2 for which I found a significant correlation with measles death. The results can be seen in table 3. Table 3. Stepwise regression to see which combination of factors has the best “fit” for explaining the change in measles mortality. Maternal mortality had the strongest relation with measles mortality with an R-squared value of .33. Adding vaccinations as the second indicator, would have added little to the model (adjusted R-squared = .34 without any evidence for a significant addition of the added vaccines [P-value 0.49]. Data not shown). Adding income as the second indicator, increased the explanatory value of the model to 41%. Air pollution increased it further to 50%. No confounder increased the explanatory effect when added. Including vaccinations! Herd immunity is the theory that an entire population can be (somewhat) protected from an infectious disease when over 90-95% of the population is immune (vaccinated) for the disease. Based on this theory, people might expect a different effect of vaccinations among populations with higher or lower % coverage for measles vaccination. 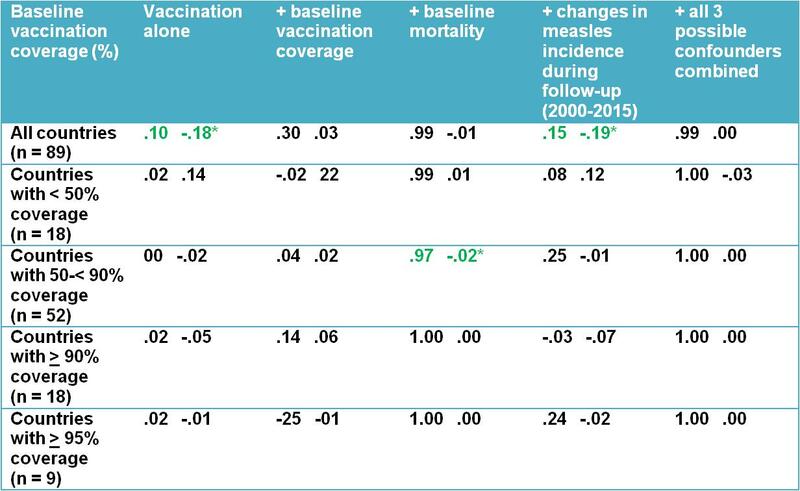 Table 4 shows vaccination effects stratified by baseline vaccination coverage. No effect modification is obvious. In addition: adjustment for baseline vaccination coverage totally eliminated the beneficial effect from vaccinations against measles mortality. Table 4. Measles vaccination & measles mortality. Adjusted for baseline vaccination coverage, baseline measles mortality or changes in measles incidence during the 15-year follow-up period. Stratified by baseline coverage. The first number is the (adjusted) R-squared value. The second number is the unstandardized coëfficiënt (indicating the direction and size of the effect). 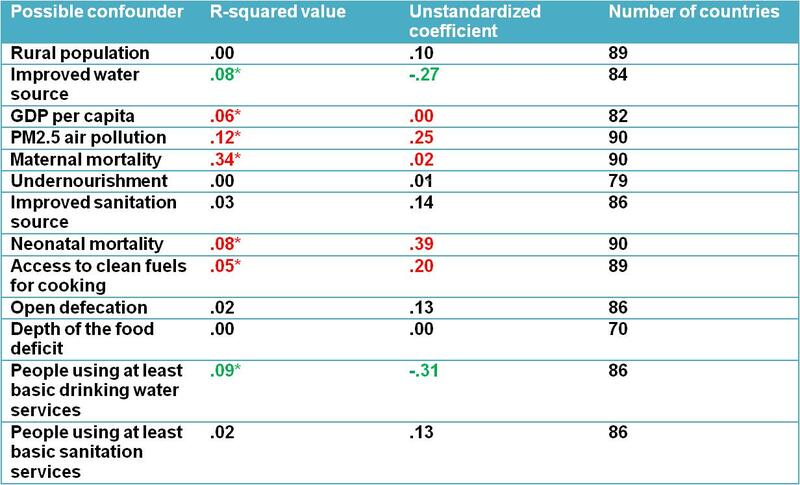 The R-squared value is related to the complete model (vaccination & confounders combined). The unstandardized coefficient is related to the effect from vaccinations only. * P for significance = < 0.05. Green colours indicate a negative association (beneficial effect with higher exposure to vaccinations). When I looked at the changes in measles mortality from 2000 to 2015, I noticed a very strong correlation with baseline measles mortality (year 2000). The R-squared value was .99. Meaning almost the entire variation in effect seems to be explained by baseline measles mortality. In other words: higher baseline mortality rates led to stronger drops in mortality from 2000 to 2015. This is not what we would expect if we assume changes in vaccination are the main cause of the decrease in measles mortality. 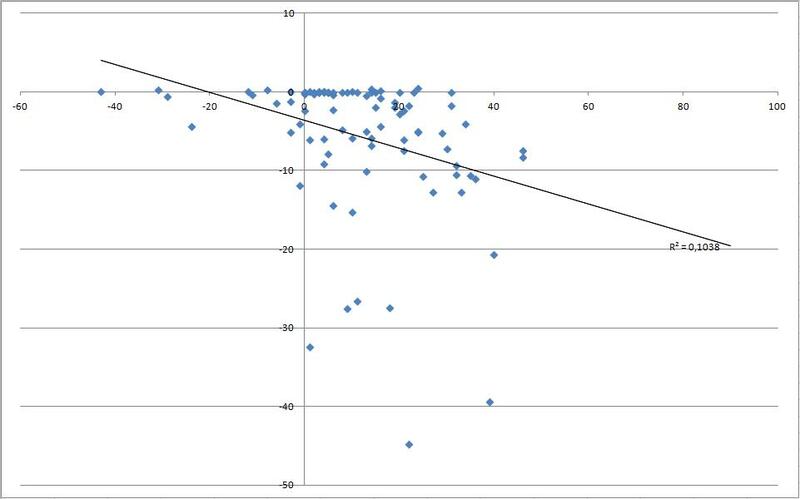 We would then expect a figure with dots that are more “randomly” distributed from the trendline. Table 4 shows that adjustment for baseline vaccination made the beneficial effect from vaccines againse measles mortality disappear. Remaining effect sizes from the vaccinations approach zero (unstandardized coefficient: -.02 to + 0.1). Figure 3. Changes in measles mortality may simply be attributed to baseline measles mortality rates. I wanted to know if adjustment for changes in measles incidence from 2000-2015 would influence the changes in measles mortality over the same 15-year period. Results can be seen in table 4. We can see that adjustment for measles incidence was associated with a slightly stronger correlation than the unadjusted results show. Going from a R-squared value of .10 to .15. With a similar effect size. As the unstandardized coefficient changed from -.18 to -.19. Summary: There is a weak correlation between changes in measles vaccination coverage and changes in measles mortality from 2000 to 2015. This correlation becomes nonsignificant when we take into account confounding factors, baseline vaccination coverage or baseline measles mortality. This is not what we would expect when vaccinations are the cause of the decrease in measles deaths. This study including data from 90 countries, does not show that the increase in measles vaccination caused the decrease in measles mortality the WHO describes. Table 5. Observations from the study. We see some weak correlations that disappear when we take a look at other factors which relate to measles deaths. This is unexpected. Especially the observation that changes in measles mortality seem to be simply/solely driven by baseline mortality rates, is of interest. I agree. But this seems to have become a religious statement. Are you saying it because you know what actual causation is? Or are you saying it, because you cannot explain what you observe? The statement cannot be used to simply ignore the results. Be honest to yourself and try to explain the findings on this page. What if the results on this page are an honest respresentation of what I found? Assume they are for a second. How can you explain any of the results in table 4 if vaccines are as beneficial as the WHO says? What would be the consequences? The strength of my analyses. The chance that is suffers from what we call “reverse causation” is diminished compared to other ecological studies. Say that I would have found an unbenificial link between vaccinations and measles mortality. Had I simply linked vaccination rates and mortality rates over the year 2015, then we would not have known how to interpret that data. Would the vaccines then have been unbeneficial? Or would the higher mortality rates have caused the need to have higher vaccination rate coverages? For this reason, I chose to look at changes in rates of vaccine coverage and measles mortality over a given time period. We would expect stronger increases in vaccination rates to go hand in hand with stronger decreases in measles mortality. Especially when we have 90 countries in the analyses. This information by itself cannot prove or disprove that vaccinations decrease measles mortality rates. It is only to help us notice what is going on in the world. It would be possible to get a better view on this topic, if we would add a graph for each and every single country where we draw trendlines for vaccinations, measles incidence, measles mortality and possible confounding factors. This would be a lot of work! But the outcome might be interesting. I don’t advice anybody to use or not use vaccines! I do recommend you to ask critical questions to health care organizations. Ask them to repeat the analyses I did to see if they get the same outcome. Ask them for graphs correlating measles vaccination to measles risk/mortality for more countries than only the USA and England. Be informed! The global decrease in measles incidence cannot be explained by changes in vaccination coverage rates. 1980-2015. Het % dat de ziektelast daalt over een onderzoeksperiode, is vergelijkbaar voor de meeste landen. Wat kunnen we hieruit afleiden? The % decrease in disease incidence over time is similar in most countries. What does this tell us? Copyright © 2019 Health statistics | Theme by SiteOrigin.